hellloooo and good morning. What a start to the day. Up at 5 out and back by 6, back out at 8 and home at 9. Boys delivered to work and college and now my day can begin. 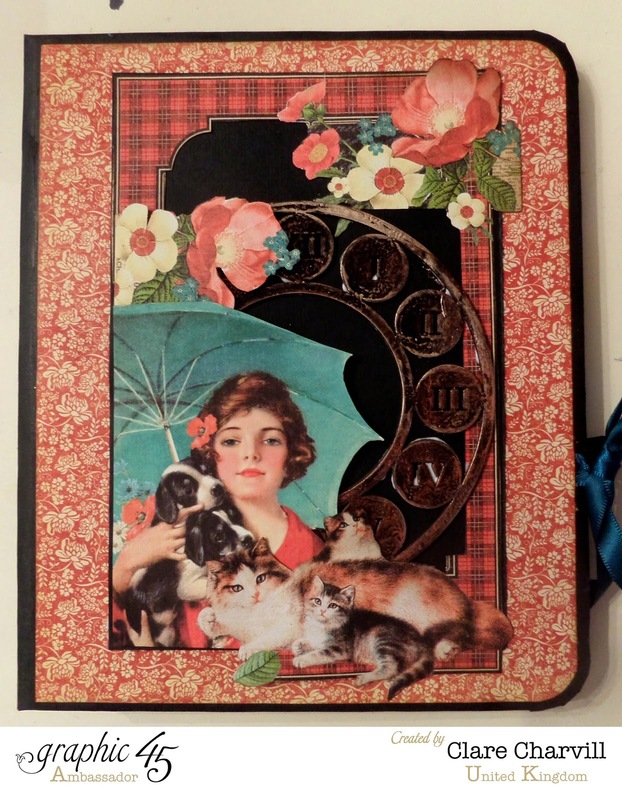 I do love Graphic 45's dark colour palette and although I'm not a cat rather than a dog lover, I really love all the imagery in the Raining Cats and Dogs collection and the colours are just up my ally lol!! This is the fourth of the Folio albums I've made using my basic folio template, and the one I'm running a workshop on this coming Saturday at Pink Tulip. Looking forward to seeing you all if you're coming along. I think there are still one or two places left if you fancy joining us too. The contact number for Sheila and the shop is 01527 852052. the project sheet for the album will be available in my shop from Monday 10th November. I thought it could be this months giveaway too. If you'd like to be in with a chance to win it just leave a comment below before midnight on 29th November. The winner will be announced here on the blog on 30th. That gives me time to pack it up and post it off to the lucky winner in time for Christmas. If you fancy coming along to a workshop next year you can find all the venues and dates booked so far over on the Workshops and Events in the UK page of the blog. Here's the link. There are more to be added over the next couple of weeks too. Its going to be an exciting year and one that will see me on TV screens in the US too. How exciting. More about that as it happens. Love the vintage look of G45 on the sleigh, a perfect table decoration for Christmas. Oh, I love this! I so wish I could come to one of your classes someday. Alas, the US is tooo far away. Hugs! Oh my goodness ... what a beautiful tablescape. I absolutely love it. Love, love, love this!!!! Thank you Clare for being such an inspiration to us!!! 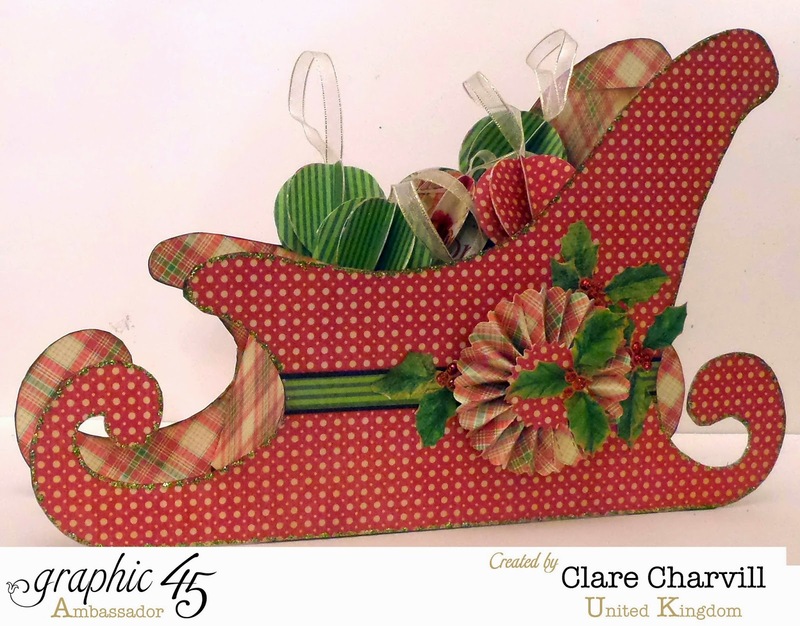 Afternoon Clare, A stunning card, and a stunning sleigh !! I adore Graphic 45, all their collections, and I adore the House of Zandra, I will be making my Christmas cards this year from Sandra's new CD, the images are magnificent. You are a very busy girlie, looking forward to hearing all about your exciting new 'happenings' !! wow it's so very beautiful Clare. All of your projects are so wonderful and beautiful! What a beautiful table decoration Claire - it would certainly be the centre of attention. I am always amazed by your wonderful projects. and ideas!! It would have a good home with me. Hi Claire, I just love the sleigh and agree it would make a fab table decoration. Sadly had to take to my bed yet again with back trouble so was unable to visit the NEC as planned today. Never mind maybe next time. Take care. Yes please, I would just love to win this template and make a Christmas sleigh. I love your albums and cards but had never thought about making a sleigh as a Christmas centrepiece. Definitely one to put on the "to do list"!